Small fish such as sardines are often cooked whole, making a delicious starring ingredient in many rustic dishes. For a more refined finish, butterflying is a great technique to learn - it removes bones, reduces the cooking time and looks beautiful on the plate. This technique can also be applied to other small round fish, such as herring and small red mullet. Sardines are oily fish, so have a rich flavour that works well with other strong flavours and acids to cut through the fattiness. Butterflied sardines are great for cooking on the barbecue, served with Mediterranean-style vegetables or sauces. 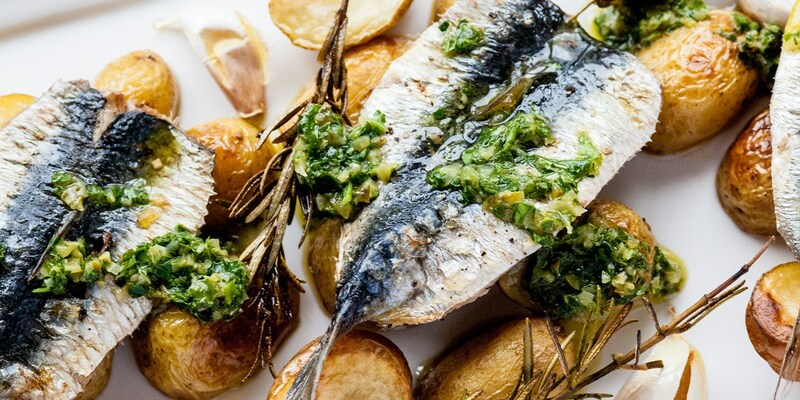 Robert Thompson serves butterflied sardines with a basil and olive tapenade and confit tomatoes, while Shaun Hill's preference is to pair with salsa verde.